The stock has plunged 16% since hitting 130 (British pounds) last Wednesday after the streaming deal was announced. Glencore’s business is a general reflection of the entire global economy: A massive cesspool of too much debt supported by economic fundamentals which are quickly collapsing. Glencore’s stock has been repriced downward by 65% since May, when it hit 318 pounds. This one is going to be a wild ride because the big banks with derivatives and debt exposure to Glencore will do their best to proliferate disinformation designed to cause upward spikes in the stock. But ultimately they can’t support of a collapsing economy and base metals commodities market. Glencore derives 37% of operating income from copper. When the price of copper dives below $2, which appears to be inevitable, it will be a disaster for Glencore. Citibank and Blackrock are among Glencore’s largest shareholders. At some point in time the Fed is going to lose control of its ability to keep the U.S. stock market propped up. That reality is inevitable but placing a bet on the timing of that reality is not easy. However when the event occurs which triggers a complete re-pricing of the U.S. stock market, I suspect that the graph of the S&P 500 will look quite similar to graph of Glencore above. The best advice I can give is that you should prepare accordingly, especially if you have the ability to get out of your retirement asset vehicles. How Bad Will The Financial Collapse Be This Time? The comparisons between the economic indicators in 2008/2009 and now have been coming ad nauseum. The only way you can avoid seeing them is if you are a Fed official, a CNBC/Bloomberg/Fox Business talking head or a complete moron. China, the EU and the United States. The economic engines of the world. China’s Shanghai Stock Exchange Composite index has plunged 27% since June 5th. It’s down 3.3% as I write this. Despite the political rhetoric and Wall Street propaganda, the U.S. and European economies are in recession. There’s no reason to wait for an official declaration of this in the United States because the majority of the economic reports for at least the last six months have been negative to highly negative. If consumer demand declines, factory orders drop as do rail shipments from ports and factories. This index encompasses rail and truck freight shipping, UPS and Fed Ex, and other goods transportation companies. It directly reflects the relative amount of consumer spending and industrial activity in the U.S. economy. Year-to-date this index has diverged by a significant amount vs. the Dow and the S&P 500. This stock sector is telling us that the U.S. economy is tanking. Of course, the media propaganda attributed the drop in oil to reports that the U.S. and Iran are close an agreement on Iran’s nuclear program. The implication is that removing the sanctions would unleash a flood of Iranian oil on the global market. But this assertion, if not completely disingenuous, is seeded in complete ignorance. It’s been pretty apparent for several weeks now that the U.S. and Iran were getting close an agreement. All you have to do is listen to the howls coming from Fox News on this subject for the past several weeks. No Virginia, the plunge in the price of oil reflects declining global demand relative to global supply. It’s pretty basic supply/demand economics, something which has proved to be over the heads of Keynesian economists. In fact, I have suspected that the bounce in the price of oil of since mid-March was induced by a combination of technically-driven hedge fund short-covering and Fed-directed Wall Street intervention. The motivation behind this price intervention would be to protect the Too Big To Fail Banks who are stuck with $100’s of millions in unsold oil shale company leveraged bank loans. As long as the price of oil remains at a certain level, distressed oil shale companies can stay current on their interest payments. A former colleague of mine who trades distressed oil debt agrees with my assessment. Just to be clear, Iran is not a significant source for the global supply of copper. Copper is widely regarded as a bellweather indicator of economic health. This is because copper is used in applications across most sectors of the economy – housing, factories, electronics – any application that uses wires, etc. Clearly demand for copper is affected directly and indirectly by consumer spending. Copper is approaching its low of the year, which is a price level not seen since 2009. The carnage Monday in the price of oil and copper is significant on several levels. First and foremost, it tells us that the global economy – including and especially the U.S. economy – is tanking. Second, it is telling us that, despite the extreme effort by Central Banks to prop up the markets and hold the global financial system together, they are beginning to lose control. There’s just too many holes springing open in the artificial Central Bank “economic dyke.” Finally, I would suggest that there’s a strong probability that there will be derivatives bombs detonating which are related to Greek sovereign debt, oil shale company debt and a wide array of commodities, especially oil. Of course, it’s only a matter of time before the Central Banks lose control of the price of precious metals. 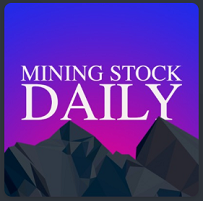 I updated the report from June and explain why I think this stock is outperforming and has the potential for significant upside over the next 12 months: Junior Miner Outperforming The Sector. 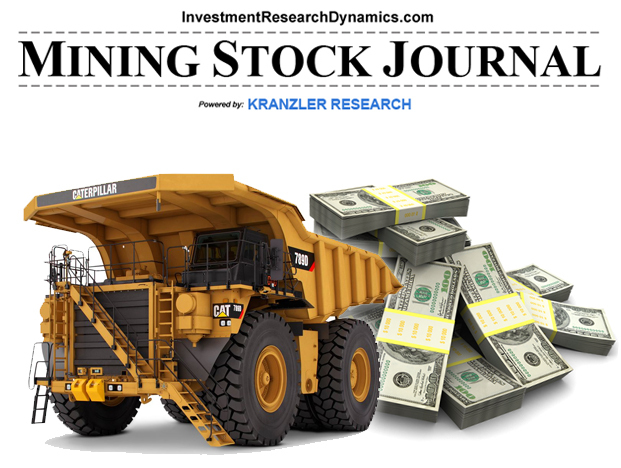 Since I posted this two days ago, the stock is up over 5% – I added a technical report which gives advice on accumulating this stock from DenaliGuide’s Summit subscription area. You can access the updated report here: Junior Miner Outperforming The Sector. I explain why this stock can at least double in the next year. 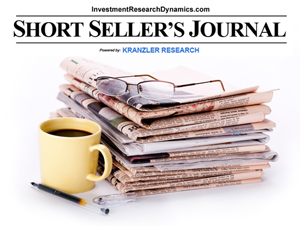 I have updated this report to reflect recent developments and I offer an explanation for why this stock has been outperforming the sector. 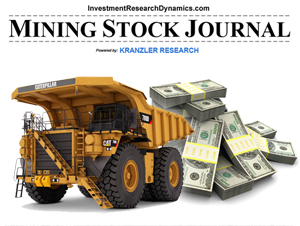 You can access this report here: Junior Mining Stock Report. I know the management was in China late last spring meeting with several of the largest Chinese mining companies. I believe the Company is engaged in very prelimary discussions about selling one of its huge copper projects to one of China’s largest mining conglomerates. I’m pretty certain that’s why this Company’s stock has held up well since the takedown of the sector began in mid-July. Even on its own, separate and apart from the possibility of any kind of M&A event, this stock is significantly undervalued. It is currently generating royalty revenue from a big gold mine in Nevada. That mine is going to be operating an expansion project in late 2015. This expansion will increase the Company’s royalty stream. That shows the ratio of the XAU index to the price of gold. The junior miners relative to the price of gold are even cheaper.